Texas Instruments announced TI-RTOS, a complete real-time operating system based on a preemptive multithreading kernel for its MCU platforms. 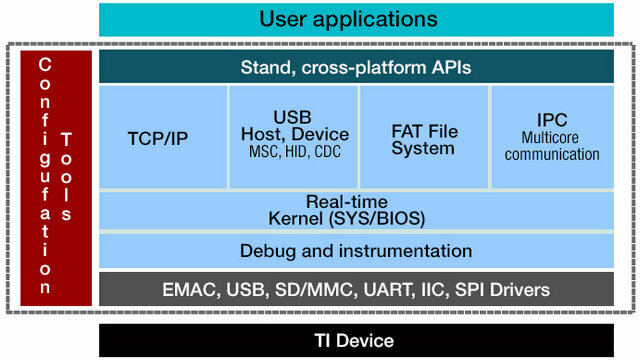 TI-RTOSs includes SYS/BIOS real-time kernel and network developer kit (NDK) TCP/IP stack. TI expects this new OS to speed-up software development by eliminating the need to write complex system software such as schedulers, protocol stacks, and low-level drivers. Ability to move functions between dual core devices to optimize performance by using the same TI-RTOS kernel on both the ARM and C28x DSP cores. Documentation and examples to augment designs, including examples and APIs appropriate for multitasking development and integration to help evaluate TI-RTOS and receive training. Modular Architecture which offers easy removal of software functionality not required in the application in order to lower the footprint. Components are also scalable, allowing for further reductions in memory requirements. TI Code Composer Studio IDE with board support packages and development kits, including the TI MCU LaunchPads. TI Design Network software developer network which can provide additional communications stacks that work with TI-RTOS. No upfront or run-time license fees and free support with full C source code and direct support from TI. TI-RTOS is available today on micro-controllers such as Stellaris Cortex-M and C28x + Cortex M3 Concerto MCUs, and will be offered soon on MSP430 and C2000 MCUs. You can find more information on TI-RTOS page, and download TI-RTOS (MCU SDK Micro-Controller Software Development Kit) for Linux (RH4 or Ubuntu 10.04) or Windows Windows 7/XP/Vista free of charge.